Here is a list of the most commonly used equipment in the league. The league requirement for all pick-ups and games are helmet, gloves, shin guards, and stick. Level of protection and any additional equipment is the players responsibility. These are just examples of what is used throughout the league and general comments about the equipment to help decide. We recommend you ask a sales associate to be properly fit for any safety equipment before purchasing. Safely equipment that does not fit properly could cause greater injury and make playing difficult. Standard ice hockey helmet. Provides full head protection. Does not provide face protection. Can be purchased at any ice hockey store or online. 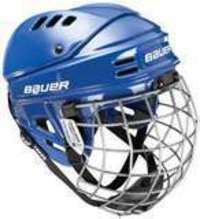 Standard ice hockey helmet with full cage. Provides full head and face protection. Does slightly obstruct view especially when looking straight down. Can be purchased at any ice hockey store or online. Sta ndard ice hockey helmet with half shield. Provides full head and partial face protection. Shield provides good face protection without obstructing view. Has a tendency to collect sweat and may fog. Can be purchased at any ice hockey store or online. 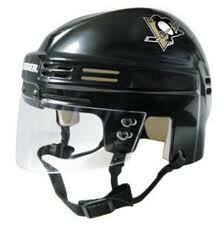 Standard ice hockey helmet with full shield. Provides full head and face protection. Provides good view but can collect sweat and fog. Generally the most expensive helmet option. Can be purchased at any ice hockey store or online. 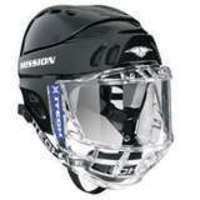 Mylec street hockey helmet. Light weight but minimal head protection. 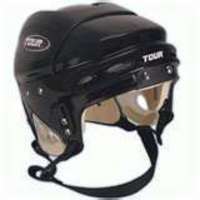 Designed for street hockey and generally less expensive helmet option. Can be purchased with a full cage. Not sold in area stores. Click helmet for Mylec store. 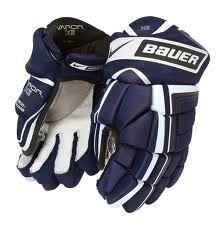 Standard ice hockey gloves. Provides full protection for fingers, top of hand, and wrist. Most popular league gloves because of accessibility and protection. Can be purchased at any ice hockey store or online. Mylec street hockey gloves. Light weight but minimal protection. Popular within the league because they are designed for street hockey. Slightly less expensive then ice hockey gloves. Can only be purchased locally at Five Hole Sports. Can be purchased online, click the gloves to visit the Mylec store. Standard ice hockey shin guards. Provide full protection for the shin, calve, and knee. Made of hard plastic on the outside and soft cushioning on the inside. Common within the league because of the superior protection and availability. Can be purchased at any ice hockey store or online. 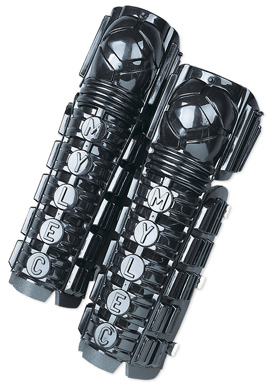 Mylec shin guards. Designed for street hockey. Light weight with foam insert. Generally more flexible then ice hockey shin guards but don't last as long. Can not be purchased locally yet, only online. Click the shin guards to visit the Mylec store. Wood stick. Cheapest option for a stick but generally don't as last long. Sticks made of wood have a tendency to be heavier than others but work just as well. Recommended for any outdoor play. Can be purchased at any ice hockey store as well as most sporting goods store. Two piece stick. Two piece sticks are composed of a shaft (generally a composite) and a separate blade (made of wood or composite). 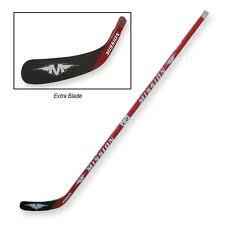 The benefits of this stick are the blade is removable and the shaft is light weight. If the blade is the wrong curve or breaks it can be replaced easily and cheaply. More expensive then a wood stick, the initial investment can also be more than a one piece. Can be purchased at any ice hockey store. 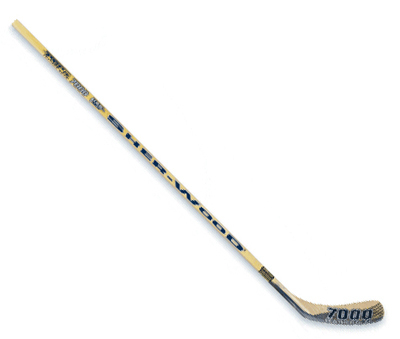 Composite stick. The composite stick is a one piece stick much like the wood stick. It is made of composite material and is hollow inside. This makes the stick extremely lighter than the wood stick but more expensive. 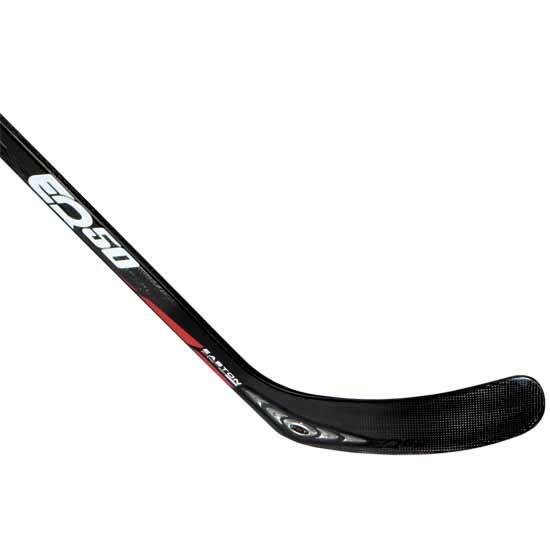 There are many different levels of composite sticks at different price ranges. Can be purchased at any ice hockey store. A note on sticks: The stick may be the most confusing item to purchase. Here is a blog that does a good job of explaining the basics of ice hockey. Flex, length, and curve. Use this info with the knowledge that a ball is lighter than a puck. You always want a stick that you feel most comfortable with, so go with what works. If you are still unsure go with a middle flex (65-75) and a stick with a sight curve and work your way from there. Don't be afraid to ask a teammate to try their stick for a few shots. It will help you decide what you like. Running shoes. A good pair of running shoes are recommended. 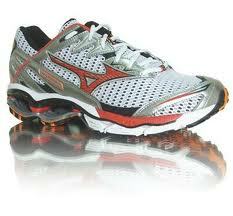 They provide great cushioning and reduce fatigue. The latest and greatest shoes may not work for yourself and cause more problems. We recommend getting fitted by a professional shop as everyone runs different. Street hockey ball. The league uses a ball and are supplied during games and pick ups. Don't hesitate to buy your own for practice. The best balls are liquid filled Mylec G-force. -A mouth guard is recommended and can be purchased at any ice hockey and sporting goods store. -A cup or jock strap. Keeps everything safe. The cups made for running seem to work best. -Elbow pads. Can be bought at any ice hockey store and most sporting goods. -Goalie Gear differs for each goalie. Most prefer light ice hockey pads. 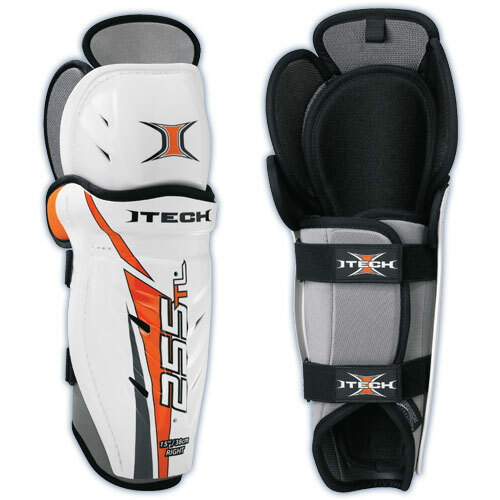 Full ice hockey gear is not used too much because it limits the goalies movement. Most goalies prefer a hybrid of street hockey and ice hockey goalie gear.